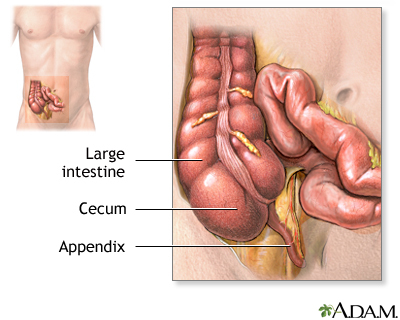 The appendix is near the junction of the small bowel and the colon. On occasion, it may become infected. Although most people are familiar with appendicitis, it is a relatively rare disease. It is treated by surgical removal of the appendix (appendectomy). Recovery time for uncomplicated appendicitis is usually just three days.